RoboForex, an international forex broker, licensed and regulated by CySEC and IFSC, presents a Tradable Bonus up to 50% to all its clients upon first deposit. Additionally, the clients can take advantage of this bonus even in a time of drawdown; the bonus will support the margin. Also, there is no time limit for this promotion and clients with several accounts can receive this bonus as many times as they desire. It’s a great opportunity, so don’t let it slide, grab it and reap the benefits! 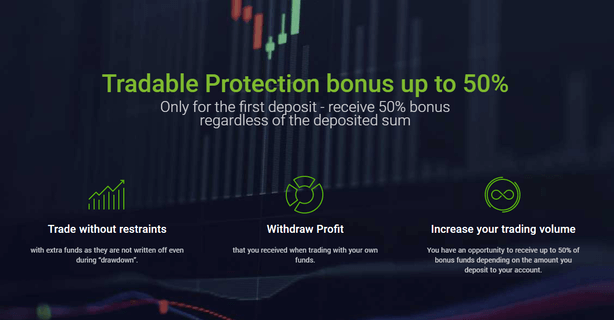 Here’s how it works: the clients who have trading accounts (Pro/Fix MT4 or MT5) with RoboForex can deposit any amount with no restrictions and receive a bonus accordingly. For example, those who deposit up to $300 would receive 25% bonus and those who deposit more than $300 would receive a bonus as high as 50%. Moreover, the clients can get up to $6000 bonus on different accounts; however, those with one account would only receive up to $3000 depending on their initial deposit. For example, let’s say you deposit $600 and receive a 50% bonus for it ($300), now you’d have to trade at least 300 standard lots to get eligible for its withdrawal; separate deposits are calculated separately. Open your personal cabinet on www.Roboforex.com, on depositing page, choose the tradable bonus up to 50%, and deposit any sum that you want; the bonus will be transferred to your account as soon as you make the deposit. Furthermore, you’d receive a 25% bonus for a deposit less than $300 and a 50% bonus for a deposit more than $300 which would be as high as $6000 (or its equivalent in other accepted currencies) depending on the amount you deposit in several accounts. The clients with ECN Accounts are not eligible for this bonus. Only clients with no previous ongoing bonuses on their accounts can get in on this promotion. The clients should deposit for this bonus only through automatic depositing system and not any other methods. In the case of having ongoing tradable bonuses, account fund is separated into the client’s fund and the bonus fund. All the closed orders are considered for calculating the number of lots excluding CFDs. In the case of program cancellation, the bonus used during the drawdown will be removed from the account. Get RoboForex 50% Tradable Bonus Now!